We are coming up to that time of the year when all thoughts turn to the Jack Cox. I thought I would take a look at what the archives can tell us about the early Jack Cox races (or the Long Distance handicap as it was known before the war). The 1500 (yard) started in season 1933-34 and we are very lucky to have the results of that race in the archives. The race had 17 starters although it looks like only 13 completed. The winner J. Faasen won it in a time of 28:56 and the fastest swimmer was Lou Morath who finished in a time of 22:58. The race entrants were all men as swimming was not in vogue for women. A sign of changing times! So who will it be this year? 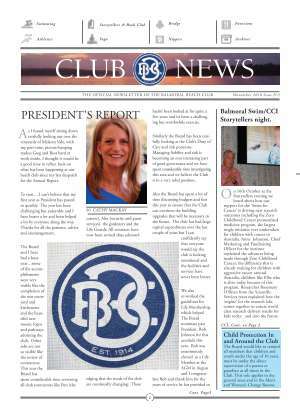 The talk at the club over recent months has been much occupied by all the creatures that have been appearing at Balmoral Beach. We have had a dolphin swim with us on a number of our ‘round the island’ swims. One Saturday race a whale joined us, and swam along with us inside the maritime buoys. And of course the topic each morning….are there any jimbles today? It made me wonder what was in the archives on this topic. The mention of Jimbles seem to regularly appear in our archives with a particularly bad year mentioned in 1975. They were even discussed at one board meeting with all sorts of ideas tabled on how to get rid of them for the races. George Franki was motivated to write a poem about them (see latest Franki Report). However it was not that that caught my eye, but a photo that had been cut out of a newspaper and provided to the archives by a club member. On a June day in 1954 at Balmoral a local fisherman landed an unexpected catch. Keith McRae, fishing for flathead with a handline declared himself `fairly rocked’ when he saw what he had pulled in – a 12ft `serpent’, pale grey in colour, with a `vicious head’ on which were feelers two feet long and no scales. Mr. McRae is quoted as saying “When I go fishing I expect to catch anything – but not this!” The photo of the catch appeared in newspapers around the country. The Australian Museum’s Curator of Fishes, G. P. Whiteley identified it as an oarfish. Oarfish are the longest known bony fish in the sea and are believed to be the origin of many sea serpent legends, as they can grow to as long as 50 feet! Little is known about them because they’re so rarely seen alive, as they generally live at depths of around 3,000 feet below the ocean surface. There have been recent sightings of Oarfish in other parts of the world. In April 2015 a 10-foot oarfish washed up in New Zealand at Aramoana Spit in Dunedin. In June 2015, a 17-foot oarfish was spotted floating in the waters off Sandy Beach on Catalina Island, California and in June 1 2015, a 14 foot oarfish washed ashore, with its tail missing, on Catalina Island, the fifth oarfish to wash ashore in California within a year. Some scientists point to earthquakes as the reason why the fish are winding up along the beach as there seems to be some correlation between them being found and seismic activity. You never know what’s out there …… look out for an oar fish when you are next swimming down at Balmoral, it may we be our next visitor. In September we were very lucky to have Haydon Skudder present to Storytellers. He told us about his experiences in World War 2 as a spitfire pilot. This is an edited version of his story with film clips of spitfires as well as photos he showed us. If you missed it click here to have a look. From 6th August to 15 August there will be a display at the Mosman Library of various photos and other items from the extensive archives of the club. The display includes early minute books and artifacts from the club, including some from WW1. If you missed the photo displays during our Centenary celebrations now is your chance to see them. As part of our Centenary celebrations a film/documentary on the Club was produced by club member Robert Hill with help from a variety of members. The photographs and film were from the archives with supplemental photos from the Mosman Library. The film was premiered at June 2014 Storytellers but in case you missed it click here to have a look.